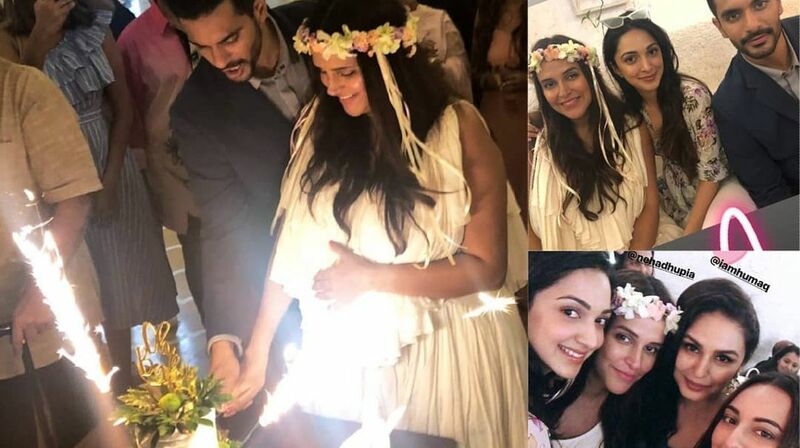 Actor Neha Dhupia and Angad Bedi, who had tied the knot earlier this year in May, had a baby shower party on Sunday which was attended by various Bollywood celebrities. The soon-to-be parents were blessed by Karan Johar, Sonakshi Sinha, Janhvi Kapoor, Vicky Kaushal and several others. Neha Dhupia, who kept her pregnancy under wraps for a long time, was looking elegant in a white flowy dress adorning a tiara on her head sporting it with appealing yellow footwear whereas Angad Bedi was seen in a semi-formal look. In an interview with IANS, Angad said he is confident that marriage and starting a family will help him become a better actor and help him develop a lot more empathy. “I am equally looking forward to spending a lot of time with Neha and our newborn baby,” he added.